A collage of different images: at the bottom in the far right stands a young girl; above is an empty swing; to the left, a circle of people clothed in black; above to the left is the image of a tank. 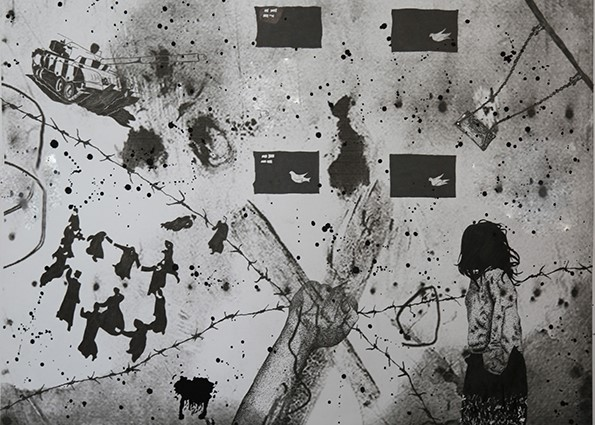 Imposed above these images are lines of barbed wire, an upraised fist, and black boxes with silhouettes of white doves in them. 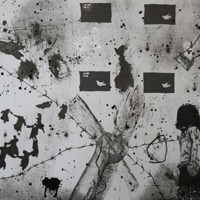 Zahra Mohebi, “untitled,” Peace Posters Dialogue Project, accessed April 23, 2019, http://peaceposters.oberlincollegelibrary.org/items/show/361.